Their love transcends space and time. 1. When Neil needed someone to lean on and Bill was right there for him. Neil and Bill are highly evolved men, unafraid to show their emotions. 2. When Bill explained what he and Neil do when they hang out. Literally the best boys' night ever. 3. When Bill tackled Neil onstage during a panel. It was for his own good. He did it out of love. 4. When they spent Thanksgiving together and even took a Turkey Day selfie. But of course they give thanks for this friendship everyday. 5. AND OF COURSE: When they took a selfie with the president. And it nearly broke the internet. 7. And how Bill saved the day when Neil's phone failed to capture the pic. Hehehehe he said "whipped it out." Bill's a good actor — he really captures Neil's nervousness and excitement. 9. When Neil and Bill had cameos on the show Stargate and they joke about the band Flock of Seagulls. Even though they're wearing space-themed neckwear! 10. When Bill taught Neil how to knot a bow tie. And they were so happy to be so dapper together. 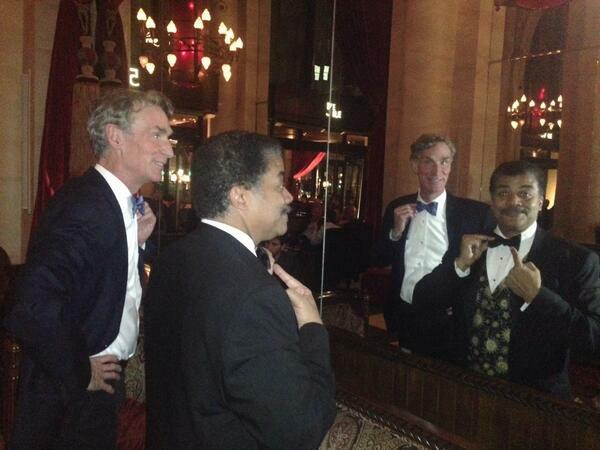 Last night in midtown Manhattan, Bill Nye @TheScienceGuy teaches me to knot my first-ever Bow Tie. 11. When they drank pink beverages from plastic cups with 30 Rock's Scott Adsit. GUESS OUR INVITE GOT LOST IN THE MAIL, EH? Aww, it's nice to give your friends credit for their strengths. 14. When Neil was giving a talk at Florida State University and decided to call his buddy Bill in front of the audience for some extra insight. And had adorable technical difficulties with speakerphone. 15. 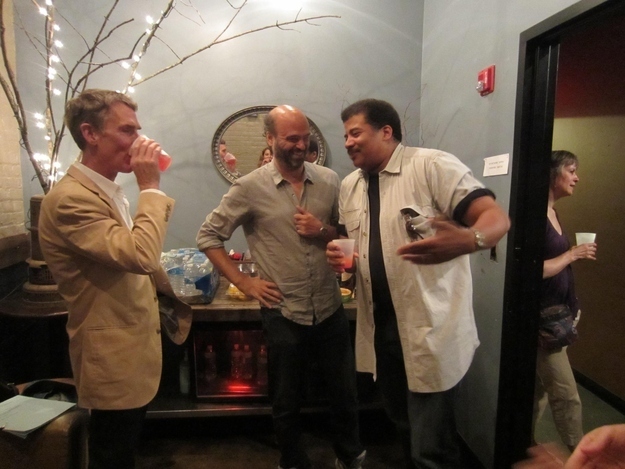 And when Bill joked about how he and Neil are planning a run for office in 2016. YOU HAVE OUR VOTES, GENTLEMEN. So ... when can we all hang out?